nuNAAT's Ultra Keratin Touch is a revolutionary, new volume reducing and smoothing treatment that works with the natural textures of your hair. This quick and easy, do-it-yourself hair smoothing system is suitable for all hair types and lasts up to 30 days. Very curly hair will become smoother, while naturally straight hair will appear healthier and shinier. Extremely coarse hair types will see a reduction in frizz and curl. All hair types will notice restored shine and bounce for an all-natural look. Each kit includes Ultra Care Shampoo, Ultra Smoothing Gloss and Ultra Care Conditioner and is retailed at $24.99. 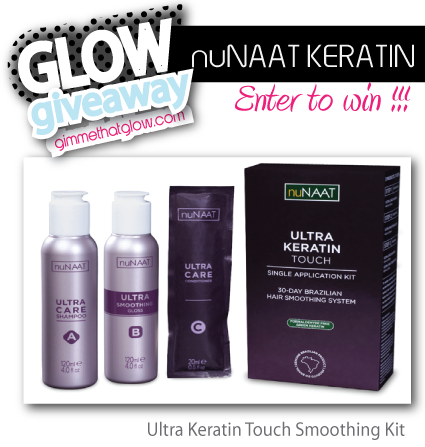 For more info please visit http://www.ultrakeratintouch.com/ and http://nunaat.com/.